Following up on the 802.11ac 2x2 chip unveiled this summer, Marvell has announced what is said to be the industry's first 802.11ac 4x4 wireless local area network (WLAN) system-on-a-chip (SoC). Providing streaming data rates of up to 1.3Gb/s when using four antennas, the Avastar 88W8864 is designed to improve the throughput of retail and enterprise access points, hotspots, service provider gateways, video bridges and set-top boxes. IEEE 802.11ac operates on the 5GHz band and compared to its predecessor, 802.11n, Marvell says it offers triple the throughput and over double the efficiency when handling high-speed loads. It touts a wider RF bandwidth (up to 160MHz), multi-user MIMO and more MIMO spatial streams (up to 8), and high-density modulation (up to 256 QAM). The new standard is still in development, but draft versions have begun appearing in a few products. 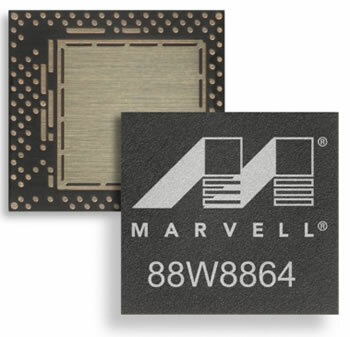 Like the 2x2 Avastar 88W8897 shown earlier this year, Marvell's latest creation crams various wireless standards into one chip. Along with Wi-Fi, the 88W8864 offers Near Field Communication (NFC) and Bluetooth 4.0 connectivity as well as support for Miracast, the Wi-Fi Alliance's AirPlay-like peer-to-peer multimedia streaming specification, which is currently only available on Google's Nexus 4 smartphone -- at least as far as we know. Other noteworthy features include "beamforming," a technology that enhances wireless performance and enables the ability to do things such as streaming HD video where devices would have otherwise had a lousy connection. The company claims that this solution outperforms the range extension of other digital signal processing methods by at least six times, on top of boosting the battery life of any device connected to the 88W8864. "The 88W8864 is unique in that it is designed to ensure seamless wireless throughput of high bandwidth data applications and enable reliable, carrier-grade HD multi-stream video distribution over Wi-Fi networks, delivering high-quality, low latency, artifact-free video content across service provider gateways and set-top boxes," Marvell said. The company plans to use the chip in many of its media platforms over the coming year or so.